There was a point in “The Hobbit: The Desolation of Smaug” in where I just couldn’t watch. It wasn’t because it was awful (even though I’m no Lord of the Rings fan) but because it was downright terrifying. Giant spiders have attacked our heroic dwarves and our lead hobbit on their journey to reclaim their homeland. I love being scared but if there’s one thing I love more I love being so scared I can’t even watch it. I admire that. A point for director Peter Jackson. This second entry in the seemingly endless “Hobbit” prequel series feels every bit like its predecessor except that it features a few more standout moments. Fans of this stuff will most likely be thrilled while those who could care less would be better doing anything else. For me, attempting to recap the plot of a "Lord of the Rings" film is like asking a four year old to explain advanced mathematics. I can try, at least, to bring up the basics. Picking up where the first film left off, adventure-seeking hobbit Bilbo Baggins (Martin Freeman) and his group of hairy dwarves are still pretty far from their mountain homeland which was taken over by a giant fire-breathing dragon named Smaug (voiced well by Benedict Cumberbatch). There are plenty of things standing in their way including a sequence in which they’re attacked by gigantic, CGI spiders which is simply so terrifying for arachnophobes that I couldn’t even watch it. They’re rescued by a familiar looking elf named Legolas (Orlando Bloom) and his elfish people who quickly imprisoned for trespassing on their land (which doesn’t seem fair to me but what do I know). There’s a new Middle Earth character named Tauriel (Lost’s Evangeline Lilly) who has the hots for one of the dwarves. 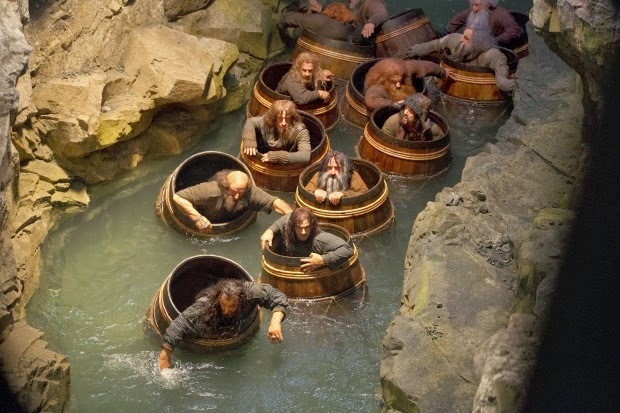 From there a very enjoyable sequence involving floating barrels ensues while the group is being hunted by the evil Orcs, who want to kill them for some reason? And there's some glowing stone that Bilbo wants to get. Apparently having one of those magical rings just isn't enough? The spider sequence and the barrel sequence are real the stand out moments in this second adventure. Even at a relatively short runtime for this type of film (at 160 minutes) the film feels rather long and offers no real resolution (we have to wait for the third part for that). The final sequence involves Bilbo’s long awaited confrontation with Smaug who is pretty expertly conceived and designed. Look at the way his belly glows orange before spitting out fire. Pretty cool. But like any good Peter Jackson fantasy epic things just overstay their welcome and you become sort of immune to all the CGI landscapes and creatures, creative makeup, and amusing action scenes that go on forever.